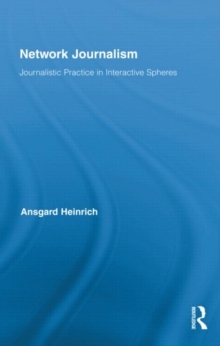 Drawing on current theoretical debates in journalism studies, and grounded in empirical research, Heinrich here analyzes the interplay between journalistic practice and processes of globalization and digitalization. She argues that a new kind of journalism is emerging, characterized by an increasingly global flow of news as well as a growing number of news deliverers. Within this transformed news sphere the roles of journalistic outlets change. They become nodes, arranged in a dense net of information gatherers, producers, and disseminators. The interactive connections among these news providers constitute what Heinrich calls the sphere of "network journalism."